My fabulous illustrator is Erin McGuire. She did the jacket art for When the Butterflies Came and Circle of Secrets. Check out Erin's very interesting blog and see the other books she's illustrated. Fabulous work! I'm very lucky! 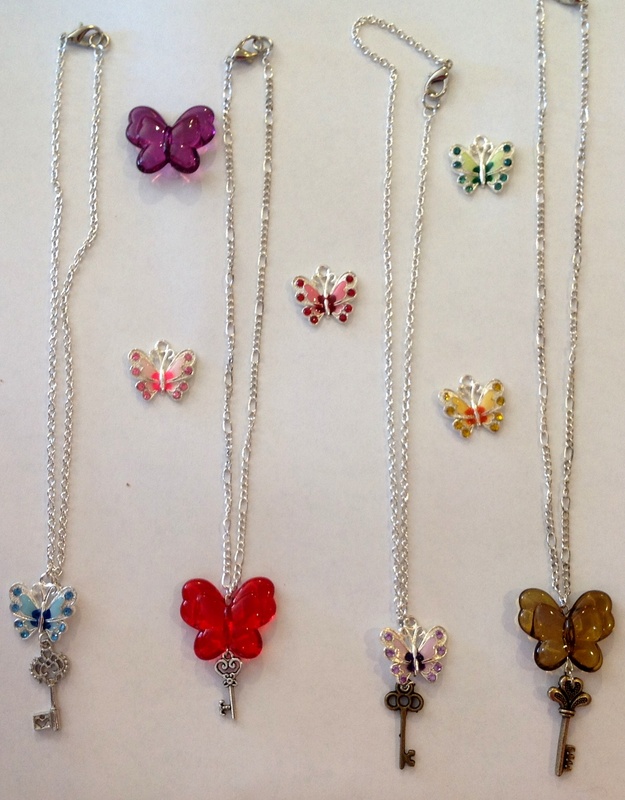 Purchase a beautiful *BUTTERFLY NECKLACE* for the special daughter, niece, granddaughter, or friend in your life. American Library Association BOOKLIST Review: "Twelve-year-old Tara’s chaotic life has always be steadied by one person—her beloved Grammy Claire. Now Grammy Claire is gone, and the Louisiana home that has sheltered Tara’s family for generations may be repossessed. In the midst of her grief, Tara’s heart is lightened when an extraordinary butterfly flies through her bedroom window and lands on Tara’s finger. Then a mysterious letter arrives for Tara—from Grammy Claire! This is the first clue in a secret mission that Grammy Claire seems to be directing from beyond the grave. Tara receives a set of variously shaped keys, each one unlocking the next clue, always written in Grammy Claire’s handwriting. In many ways this is an old-fashioned mystery that depends on Tara’s wits, not, refreshingly, from magical solutions and supernatural powers. While sophisticated readers may find the sequence of keys and clues somewhat unbelievable, young mystery lovers will enjoy the chance to test their own detection skills. Recommend this to readers who have enjoyed books by Andrew Clements or Blue Balliett. Grades 5-8. 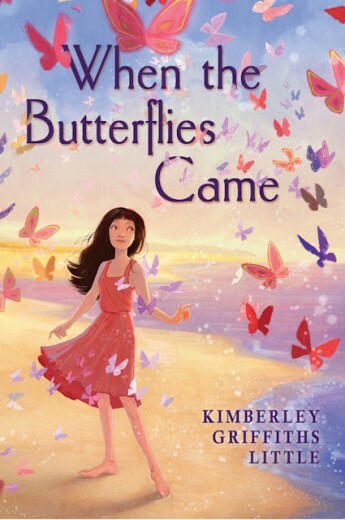 Kirkus Reviews: "The day following her grandmother's funeral, butterflies begin visiting grieving 12-year-old Tara, who's swept into a bizarre mystery involving her grandmother, butterflies and a small Pacific island. Raised in a deteriorating Louisiana plantation house. . . Suspense builds as Tara relies on her wits and follows her heart to Chuuk, where she risks all to save Grammy's butterflies. Plucky Tara tells her implausible tale in a colloquial first person, present tense that slips occasionally, allowing readers to feel her grief, wonder, fear and surprise. Middle-grade readers should respond to this perplexing puzzle and its resourceful heroine." Children's Literature: "Twelve-year-old Tara Doucet is distraught over her Grammy Claire's death. She feels alone in her grief; her mother suffers from depression, her older sister Riley is aloof, and her divorced father has moved far away. Moreover, the family can no longer afford the upkeep on the Bayou Bridge mansion that has been in her family for many generations. The first of the butterflies arrives the day after the funeral. Shortly thereafter, a mysterious envelope arrives for Tara with a series of instructions from her now-deceased Grammy. They lead Tara and Riley to Grammy's home in the South Pacific, where Tara learns that her grandmother was killed because of her scientific research on the butterflies from the island of Chuuk. Through the clues, Tara discovers the identity of the killer and the special power of the butterflies. Kimberley Griffiths Little leaves clues along the way for readers to follow in this intriguing environmental/medical mystery. The story is cleverly put together with several red herrings and a fine twist at the end. Good development of the storyline of the two sisters, as well as a budding romance between Tara and an island boy make this a fun read." BOOK PAGE: "'The first butterfly comes the day after the funeral.' Often, the first line of a book is just that, a generic starting point for a story that has to begin somewhere. But sometimes, that first line can be magical, pulling readers into a book that they have no hope of escaping until they arrive, breathless, at the end. When the Butterflies Came is one of those stories. Its sublime first line transitions into a tale filled with intrigue, love, suspense and heartbreak." "Tara Doucet, descendent of a proud, traditional Louisiana family, has just lost her beloved Grammy Claire. Tara’s mother has withdrawn from the family, leaving Tara and her older, much grumpier sister Riley to fend for themselves. But then, the first butterfly comes—big and beautiful, right through Tara’s window—and hovers directly in front of her. This butterfly sets in motion a series of events that will transport Tara and Riley from their home and into the middle of a mystery that becomes more dangerous by the day. When the Butterflies Came is a unique book that defies definition. It could be called a murder mystery, a coming-of-age story, an environmental tale or a fantasy. Whatever the category, it is definitely engrossing—right from the very first line." Hi Kimberley, My 9 yr old daughter & I just finished the book and loved it. Thank you so much. We’re hosting her book club this month on this book, and wanted to also thank you for the discussion questions and activity guide, and recipe!! SO greatly appreciated!! PLUS we’re excited to see the movie trailer. Do you know when it will air? How do you order the bracelet from circle of secrets. Just finished reading my grand daughters book. I know she would love to have the bracelet. Love When the Butterflies Came! ask. Would you be interested iin trading links or maybe guest writing a blog post orr vice-versa? My site aaddresses a lot oof the same topics as yours and I feel we could greatly benefit frrom each other. I looik forward to hearing from you!Wonderful blog by the way! hi Kimberly my name is Allison Barthel I read when the butterflies came and it was the best book I have ever read in a long time. I could not put the book down. you are an amazing author and very pretty too. you have inspired me to write my own books. if you get this email and read it, if you have time please email me back. but you probably have a lot of fan mail. but I would be honored if you could email me. hi Kimberly I read when the butterflies came and it was the best book I have ever read in a long time. I could not put the book down. you are an amazing author and very pretty too. you have inspired me to write my own books. if you get this email and read it, if you have time please email me back. but you probably have a lot of fan mail. but I would be honored if you could email me. wow I just cant wait to read this book. I love how you made a book for Shelby Jayne, Tara, and Larissa! haven’t had a good reading like this in a while. So special thanks to you. 🙂 just a quick question, do you think that it matters what order I read these books. ive already read circle of secrets but haven’t gotten around to the othertwo you published. just wondering if it matters. Hey I love your books but I’m wondering if these stories are based on a true story?? PLZZ reply back i love u! You should make more and more and more books i love’em you’re such a great author dont never stop no matter what anybody says or thinks dont let not one person get in your way of youre dream. I will never forget this awsome book you wrote and trust me i just wanna read it over and over again!! i <3 you! this book is so amazing you should make a second book on it only the grammy comes down from heven and come back to life and she helps tera also I’m a huge fan!!! Thank you so much for your lovely comment on my website! I’m thrilled that you enjoyed When the Butterflies Came and The Time of the Fireflies so much, that really makes my whole week! I love that you “got sucked in”. That’s awesome. Yes, I have two other books in the same world on the bayou. The Healing Spell and Circle of Secrets. They actually take place before Butterflies and Fireflies, but you can read them independently. Miz Mirage is in both, too. . 🙂 I think you’ll really enjoy them. Thanks again for your message! OMG!!!!! I LOVE The Time of the Fireflies,The Healing Spell,and When the Butterflies Came. 🙂 they r awesome.i just finished The Healing Spell!!!!!!!!!!!!!!!!! i just figured out that after reading The Healing Spell,that all three books are in the same place.i rd SSSSSOOOOOO MUCH!!!!!!!! Hi Cookie, thank you so much for such a lovely comment. I’m thrilled to know that you loved all my books! I hope you read Circle of Secrets next! It’s awesome, too. 🙂 Thanks again, you made my day! i LOVE ur books!!!!!!!!! they r awesome .i just finished Te Heaing Spell.i rd SSSSOOOO MUCH!!!!!! !